Experts said that China's cross-border capital movement must be in accordance with its national strategy, after State broadcaster China Central Television (CCTV) named retail giant Suning Commerce Group in a program discussing domestic companies making risky overseas acquisitions, sending the company's shares down nearly 6 percent on Wednesday. The CCTV program, aired on Tuesday night, broadly discussed what government officials call "irrational" overseas investment by a number of domestic companies, following a stern statement by the nation's top economic planning agency on Chinese overseas investment in real estate, hotels, cinemas, entertainment and professional sports teams on the same day. 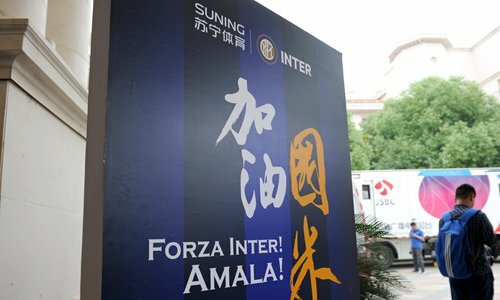 In the CCTV program, Chinese retail giant Suning's acquisition of a majority stake in Inter Milan in 2016 for 270 million euros ($311 million) was mentioned. Markets reacted by sending the shares of Suning's listed arm Suning Commerce Group Co down by as much as 6 percent in morning trading on Wednesday. Suning's shares closed the day at the Shenzhen bourse at 10.63 yuan ($1.60) per share, down 2.74 percent. "If the companies strike these deals with their own capital, whatever they do is absolutely justified," Yin Zhongli, a research fellow at the Chinese Academy of Social Sciences, was quoted as saying in the CCTV report. "The fact is that many of these companies have high liability ratios, and borrowed from banks and financial institutions. If their investment proved to be a bad one, it will greatly increase levels of nonperforming loans for domestic banks. In this sense, it can be said that these firms gained a public relations harvest or made a fortune at the expense of increased domestic financial risks," Yin said. There can also be hidden intentions such as money laundering and moving assets overseas, Yin said. Addressing the market's concerns, Sun Weimin, vice president of Suning Corp, said in a statement e-mailed to the Global Times on Wednesday that the company absolutely supports the government's industrial policy concerning overseas investment. Sun said that the Inter Milan deal is aimed at learning from international experience and improving the level of domestic soccer, and also borrows the brand influence of the team to expand Suning's overseas retail channels and bring made-in-China products abroad. Suning is not alone in purchases in the sectors mentioned by the NDRC official. Chinese conglomerate Dalian Wanda Group, which led an overseas buying spree including hotels and cinema chains, has reportedly faced loan suspensions, according to a Reuters report on Monday. Dong Dengxin, director of the Finance and Securities Institute at Wuhan University of Science and Technology, said China's current management model of capital accounting means that companies like Suning have no other way but to "absolutely support the government's industrial policy concerning overseas investment." "Amid the explosive growth in overseas investment in 2015 and 2016, some investments have nothing to do with improving China's national strengths and its level of technological sophistication. These deals are just a waste of precious national resources and foreign capital exchange reserves," Dong told the Global Times on Wednesday. Following an 18-percent annual increase in China's outbound direct investment (ODI) in 2015 and another year-on-year jump of 44.1 percent in 2016, China's ODI in nonfinancial sectors fell 45.8 percent year-on-year to $48.19 billion in the first six months of this year, data released by the Ministry of Commerce showed on July 13, amid tightened control by regulators. "The Chinese government will stay its course on encouraging domestic firms to participate in global competition, mixing with the global industrial chain and value chain. Competent, qualified domestic companies conducting real, compliant overseas deals will be still supported. Its policy in simplifying administrative procedures and improving its services in the supervision of overseas investment will also remain unchanged," said Yan Shiqiang, an associate research fellow at the Chinese Academy of International Trade and Economic Cooperation under the Ministry of Commerce. "Cross-border capital movement must go hand in hand with China's national strategy on development," Dong said. "For instance, such a movement should support the Belt and Road initiative, which is a national strategy." "As the money is financed by domestic sources, profit-seeking should not be the ultimate goal in overseas deals," Dong said. "What we will see in the future is that the regulators will combine efforts on improving medium- and long-term mechanisms with short-term circumspect adjustment. They will continue to push facilitation of outbound investment but also guard against risks from global adventures," Yan told the Global Times Wednesday. Cross-border investment is also under utmost scrutiny in the US and Canada, and China should learn from the two countries to enhance its supervision, as it relates to national security, Dong said.